Very few of us can accurately predict the future, but with the rapid explosion of data capable cellphones known as smartphones I believe the time has come to put the personal computer, this includes desktops, notebooks, and mini notebooks to rest. The transition will take a few years but eventually the majority of us will not use a PC as we know it today to do our work. I see a future where new employees for companies are given the best smartphone for their work, no business notebook or PC. 1. Sheer numbers – More smartphones in our hands! According to IDC Insights, smartphone sales surpassed PC sales for the first time in Q4 last year. As shown in the accompanying chart, over 100 million smartphones were shipped in Q4 compared with 92 million for PCs. While that in itself is astounding what is even more impressive is the growth curve, last year over the same period about 54 million smartphones were shipped which indicates that the number of world wide shipments for smartphones almost doubled in one year while PCs growth was a meager 3 per cent. What this analysis indicates is that a good majority of us will have a smartphone in our hands in the not too distant future. 2. The power of the Smartphone rivals that of the PC! Cell phones today are coming with enough processing power to rival that of the PC. Take a look at the latest devices in the market, the Motorola Atrix (it comes with a 2GhZ processor ), the LG Optimus 2X (it has a dual core 1 GHz process) and a majority of smartphones like the iPhone 4 come standard with a 1 GHz processor. So the specs of the cell phone today are enough to run most of the applications we use for our business needs and even some of the more complex tasks. 3. The power of the APP! As Apple proudly says, “there is an app for that”! The explosion of apps designed for the smartphone allow us to do the work we normally do in the office on our smartphones. While today the apps created are rudimentary and included limited features of the PC version, it is only a matter of time before more advanced apps are created that provide ALL and even additional features to its PC counterpart. In fact, with over 350,000 apps on Apple, 150,000+ with Google and another 40K between RIM and Windows Phone it is fairly easy to see that there will be business applications created for smartphones that do NOT have a counterpart on the PC side. 4. Cloud computing is the future, we just need to connect to the cloud to do work. One of the key advantages that the PC has over the smartphone is that is can store hundreds of gigs of data, most are needed to run applications and store data. Cloud computing is changing this rapidly. With data and applications being stored offline, smartphones can expand its capabilities into the productivity suite of applications that business so heavily rely on. BlackBerry provides a blue print on how Smartphones can be secured on and off a corporate network. In fact, BlackBerry has done such a great job that Smartphones running BES with the necessary security policies in place provide even more security than what exists on the regular network of most businesses. Mobile security profiles allow remote locking, wiping of data and even tracking of smartphones via GPS technologies. Some of these security options do not exist on business laptops today. 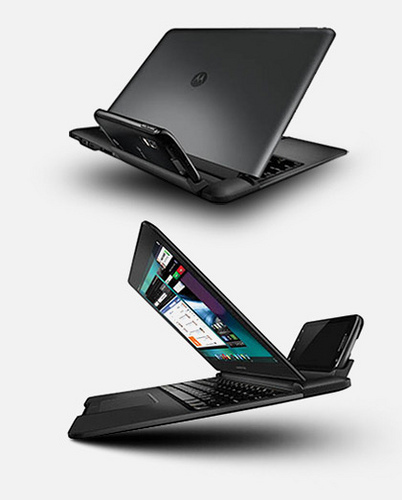 The Motorola Atrix provides a model of what the future will look like with a docking port. While we can do alot with the smartphone it is difficult to review detailed charts, pdfs and the screen can be difficult to read at times. The idea of a docking port is not new but the first attempt by Motorola shows how it can be done and while the port is expensive today and may not include everything we need, I believe this will only get better and more affordable with time and innovation. In fact, I believe that docking ports will be manufactured separately and come with a standard docking connection for all smartphones. So regardless of the cellphone you select the docking port will essentially be a cost effective lightweight alternative to the business computer as we become more mobile professionals. Offices of the future will have docking ports for us to connect our smartphones and do work. The workplace is changing. Technology has allowed us to do more with less. Globalization, telecommuting and the ever mobile business professional are factors which change the way we work. The traditional cubicle or office will be less of the way we work tomorrow. Shared cubicles, work from home options will drive the smartphone to the centre of the workplace. The average smartphone costs about $500, while the average business PC or notebook will cost about $900, that’s close to $1500 to equip a professional. Imagine doing away with the PC and taking the smartphone on contract for $100 plus the purchase of a smartphone docking station for say $200 (this is based on an estimated future cost of a docking station), that’s $300 to equip a professional vs the $1500 price tag before. With connectivity protocols like DNLA (Digital Living Network Alliance®) we will be able to connect multiple devices in a home or office. So your smarpthone can connect to your DNLA TV to view a video or to attached storage devices and digital media servers. These toolkits expand the power of a little cellphone and make it powerful enough to do multiple tasks via other devices and media. The nature of our work will continue to be more centreed around email, collaboration, social media and this will be easier achieve via mobile computing. Collaborative tools are important in the work place and will continue to increasingly become more important because of the mobile nature of the business professional. These collaborative tools will be most effective through cell phones and mobile devices. Those are my 10 reasons. Before I end I want to say one final word about tablets. I consider tablets to be a mobile device and not a PC product. I can see that the tablet will play an equally important role in the office along with our cell phones. Both devices will transform the way we work and how we work in the future, but I believe it is the smartphone that will drive this change while the tablet will support these changes in the future.